Is anyone elses hair REALLY suffering with all the weather changes recently?! Mine tends to go from one extreme to the other and it’s incredibly annoying. I suffer with frizziness and dryness mostly but it’s understandable due to the amount of bleach I’ve used on it since I was 13. 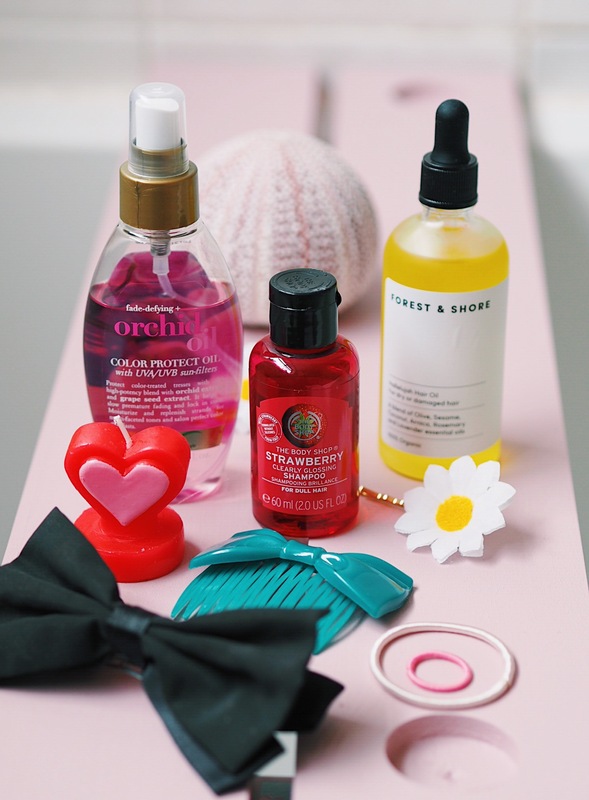 As Summer is (hopefully) on its way, I thought I’d put together a list of a few things I’ll be purchasing and using to maintain some luscious locks in the sunshine! I’ll start with some things that are on my “to purchase” list for achieving that healthy Summer shine. First and foremost, I’ve heard incredible things about L’occitanes Organic Shampoo*. There’s a few different options on offer depending on what your hair personally needs. In my case, it’s pretty much everything. They have formulas specially made for helping the body and strength of the hair, revitalising it and what I mostly need – repairing the hair. Having bleach and heat damaged locks (on top of medication induced hair loss/snapping) is no fun at all. Treating your fabulous mane to natural products containing essential oils is sure to restore it and put the flair back in. 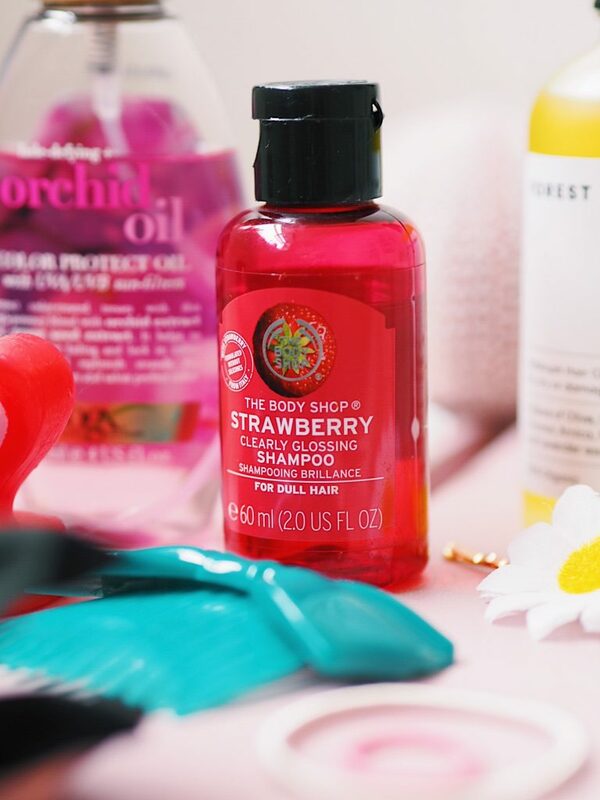 Another thing I am dying to purchase is the Strawberry Clearly Glossing Conditioner from The Body Shop. I received a travel size version of the shampoo for my birthday, the smell is divine and it leaves my hair feeling so clean and fresh! I’m also a huge lover of The Body Shops Banana hair range, particularly the conditioner. I’d like to hope that the Strawberry is just as nourishing. I have a £5 birthday voucher on my Love Your Body card from my birthday so I might just have to make a purchase soon. Keep your eye out for a review! I currently have two oils that I switch between using depending on convenience and preference on that day. 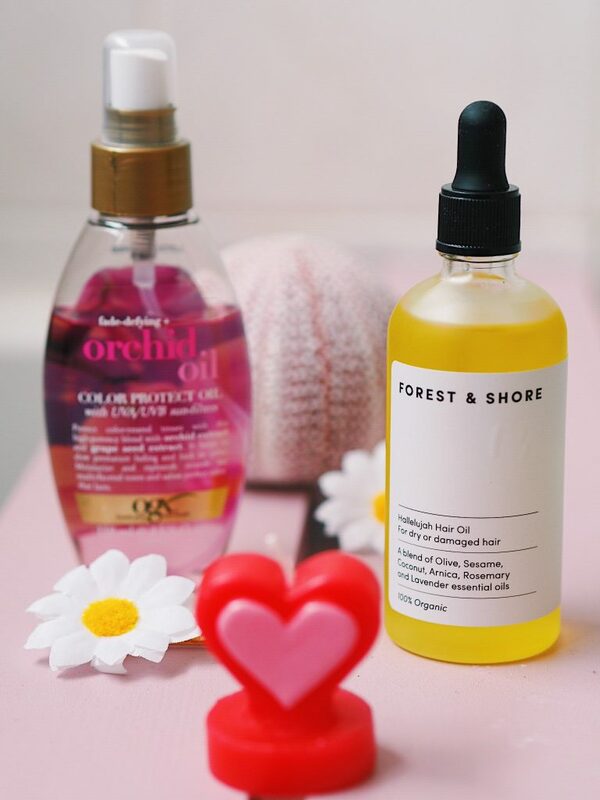 The first is the Forest and Shore Hallelujah Hair Oil which I did an entire post on here. It’s all natural, full of organic oils and the scent is super calming as the most prominent aroma is lavender. It’s a fabulous one to put on before bed and for deep nourishment. This is a product you can also use as a treatment and cover the hair in for a more long-term effect. The other is the OGX Color Protect Orchid Oil. I love how easy to use this one is as it’s a spray bottle so you don’t have to get your hands all oily to use it. The scent is really floral and sweet and stays in the hair for hours after use. I adore the cute pink bottle too and I don’t think it’s too bad a price at around £7 for how much use and the benefits you get from it. There are small changes you can make to your routine to ensure your hair is looking and feeling its best. one being to wash it less. I try to wash my hair at a maximum every three days, if I can get away with it I’ll leave it four! At one point I was washing mine five days a week so I know how difficult it is to get out of the habit. It’s definitely true that your hair adjusts to your washing habits though so I’d really recommend trying to cut it down. Start delaying it an extra day for a while and if you feel it looks dirty then grab yourself some dry shampoo or style it into an updo or a plait. It’s bound to be glowing for longer in no time. Another change you can make is to touch and brush it less. As much as I love anyone playing with or brushing my hair, it really does contribute to fall out. If you can help it, try and brush your hair once in the morning and once before bed. Touching it less will also lessen the amount of oil and grime in your hair which will ensure minimal washing, too. On the topic of brushing, i’d also advise getting a comb instead of a brush. I was told by a hairdresser years back that combs untangle knots and bulky brushes just rip them out (often from the root). 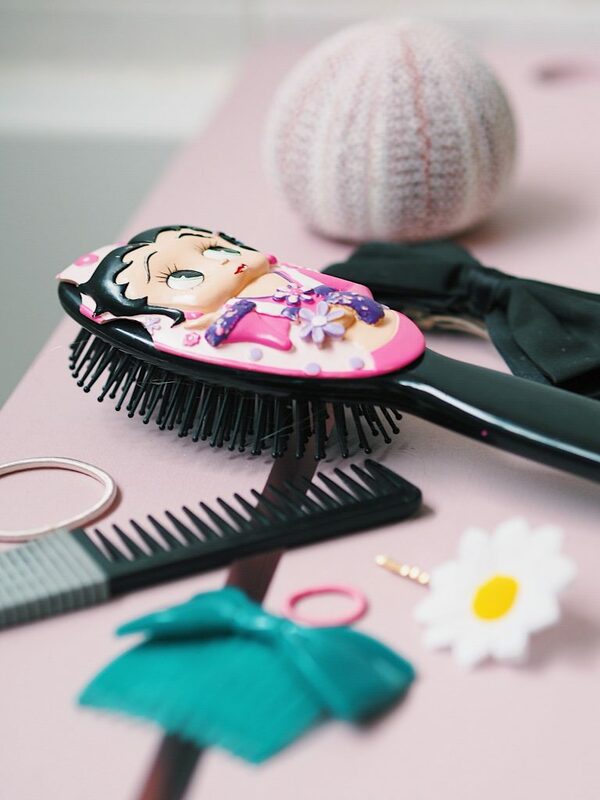 I use a comb the majority of the time now and I have noticed that it collects a hell of a lot less hair than my brush does! Is there anything you do or products you use to keep your hair in tip top condition? "Budget Makeup Essentials Under £10!" "A Short Break Exploring Cinque Terre!" I’ve never tried any hair care products from The Body Shop so definitely need to pick up some to try out. With this weather my hair is literally breaking in my hands and seriously need to up my hair care routine! I’ve never really shopped at The Body Shop but this range looks fab! I have really dry and thin hair so a huge issue for me is trying to add more volume to it so dry shampoo is always a god send for me! I know right!? Yeah the orchid oil is honestly gorgeous in every way, such a brill product! Thanks for reading. ?? My hair is dry and bleached as well! I’ve never bought shampoo at the Body Shop before–but this glossing shampoo sounds good. I will have a look for it this weekend! Like your tip about using a comb instead of a brush, will try that out! Thanks! I really rate it, it’s been wonderful for my hair recently! Glad you enjoyed.